I traveled to Phoenixville, PA beyond King of Prussia for a Sunday wedding at Columbia Station (Robert Ryan Caterering). Columbia Station is a restored train station located on a working railway. 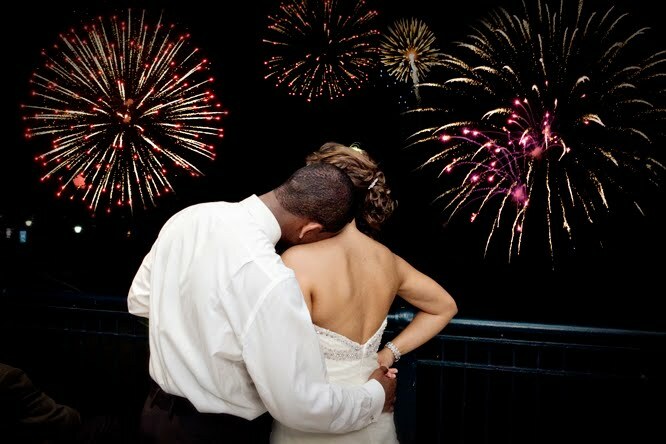 Interestingly, this wedding was held on the Fourth of July! Guests were given the opportunity at ~9:30 PM to step outside and view the fireworks. Sabir and Marina, the groom and bride, met at Ursinus College nearby. 175 guests were in attendance, split evenly between the bride and groom's side. This was a bi-cultural celebration with the groom's side of the family African-American and the Bride's side Latin (Puerto Rico). Cocktail hour, in an adjacent room, featured a combination of smooth jazz, Latin jazz, and flamenco as per the bride's request. The room was packed, and an interesting mixture of perfumes lingered in the air. Later on, the cocktail room served as headquarters for a Photo Booth. The parents were announced to the Cosby Show theme song; the bridal party entered in to an instrumental version of Kanye West's Touch the Sky. I was relaxed on the mic, and aced the introductions, including the alliterated flower girl/Jr. Bridesmaid trio of Maia, Milan and Malaysia. Marina and Sabir entered into the chorus of 'Something Special' - Usher, and enjoyed their first dance to Robin Thicke's "2 Luv Birds" off this new album (great song!). English and Spanish blessings followed, and the Best Man delivered a short but heartfelt speech, mentioning how both he and Sabir bonded as kids since they grew up without their mothers who passed away at young ages. The combined parent dance was "If I Could" by Regina Belle (Sabir danced with his Aunt Mauri). For the salad course, I kept things in the R&B genre, then tested the waters with some salsa. The response was immediate, with numerous couples coming out to dance, and things just built from there, with a packed dancefloor before the main course! This is the type of crowd that we as DJs yearn for - fun party people who love to dance. Even better, both sides of the family stayed out on the floor through the different musical genres. The groom danced well and often! The dinner, a surf and turf combination, was quite tasty. For dinner music, I played selections by the likes of the Stylistics, Otis Redding, Luther Vandross, Quincy Jones - some of the older couples came out to slow-dance, and the Aunt of the Groom gave me an awesome compliment. Cakecutting was done early, to the song "The Sweetest Love" - Robin Thicke. After dinner, I got into the hip hop and witnessed the dancefloor move to the next level - hands in the air, dance circles. Things exploded when I played Fatman Scoop's "Be Faithful," and I next slammed in DJ Kool's "Let Me Clear My Throat" to a raucous reaction. From there, I moved into 90s material, and then onto the faster dance club fare, killing things with Major Lazer's Pon di Floor, then doing a long blend of the Perculator, then a long blend into Spinzy's Electro Remix of MJ's "Don't Stop Til You Get Enough" (Ariel Perrazolli RMX). More Latin sets, and I successfully extended a merengue set with a 160 BPM merengue selection "La Abusadora" by Oro Solido. On the line dancing front, the Electric Slide and Cupid Shuffle were fun floor-fillers. I had heard a guest singing Waka Waka (Hello to Africa), the Shakira World Cup anthem, so on a whim, put it on. To my surprise and delight, 90% of the room got into a long, snaking conga line. Awesome! For the bouquet toss, imagine a packed floor of beautiful ladies shaking their ring fingers to Beyonce's "Single Ladies." Time flew by, and we closed the evening with EWF's "September," and then an encore performance with Sean Kingston's "Fire Burning" as the guests left for the sparkler sendoff outside. For those of you not familiar with the term "Smauz Standard," Spinzy and Iron Mike DJ'd a reception in Washington Crossing a few years ago where it was non-stop dance floor action. Based on this definition, last night's wedding reception met and exceeded the Smauz standard! This may very well be the party of the year, and will surely make my coveted Top Ten Party list of 2010. Congratulations to the new Mr. and Mrs. Sabir and Marina Peele! To learn more about Ambient DJ Service, visit us on the web at www.ambientdj.com. Gregg you did an amazing job at our wedding and we will be recommending you to everyone we know. Thank you so much for keep the crowd live and the floor packed. Sabir, thanks for the props - it was my pleasure to be there for yours and Marina's special day!